As a requirement for my degree, I took several conducting courses while at Penn State: MUSIC 266 (Introduction to Conducting), MUSIC 366 (Intermediate Conducting in Choral Music), and MUSIC 466 (Advanced Conducting in Choral Music). While these courses focused on the physical movement associated with conducting, they also exposed me to significant repertoire and taught me how to plan for rehearsals. For the first two courses, I completed "listening journals" where I would listen to a major work (while looking at the score) and reflect on things I noticed about the performance and about the composition. "Miss Geesey is a great conductor who is full of energy and skill." "Miss Geesey focuses on all aspects of choral singing--not just the notes and the words but the musicality and the backgrounds of the pieces, too." "From the very beginning, Miss Geesey did not seem like an intern. Her incredible musical skill allowed her the confidence to seem as if she had already been a teacher for a while. She is always kind and personable and has a beautiful voice, too. She will be very missed in the entire music department!" I was also lucky enough to be chosen for the Willa Taylor Undergraduate Choral Conducting Internship for two years in a row. Through this experience, I received my own chamber choir through Oriana Singers, a women's choir on campus. The choir was called Discantus, and ranged anywhere from six to thirteen singers, depending on the semester. I held auditions, created a rehearsal schedule, chose my own repertoire, and ran rehearsals on my own from the piano. It was a wonderful learning experience that fully prepared me to enter the classroom for my student teaching. Above is a picture from the Fall 2013 Oriana photoshoot, featuring the Discantus women. While student teaching at State College Area High School, I had the opportunity to work with all six choirs, including: Freshman Choir, Sophomore Choir, Master Singers, Chamber Singers, OMA (Only Men Aloud), and Cecilian Singers. These groups included both auditioned and non-auditioned singers in a variety of voicings (mixed, women's, and men's groups). Upon graduating, I began teaching in the district at Mount Nittany Middle School, where I worked with several different groups (descriptions can be found here). Since my time at Penn State, I have been studying privately with Dr. Christopher Kiver, director of choral activities at PSU. In my lessons, we focus on gesture, interpretation, repertoire, and music history. A repertoire list of what I have been studying can be found here. 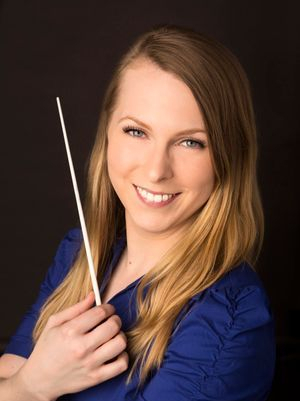 During the summer of 2016, I was also fortunate to be able to take choral conducting graduate courses at Michigan State University through their LifeLong graduate credit program. I spent five weeks studying choral literature and choral conducting focused on repertoire from the Baroque period. I thoroughly enjoyed my time there, and the experience made me even more excited to pursue a graduate degree in choral conducting! Throughout my conducting lessons, practice, and teaching, reflection has played a significant role in my development as a conductor. Though I can be very critical of myself when critiquing my own conducting gesture, I am excited to see what my future holds in terms of my conducting. I am very interested in pursuing higher education degrees in choral conducting and look forward to continuing my growth as a conductor.